This is Wayback Wednesday, your midweek blast from the past! In this feature, we dig into the archives, look back at the history of basketball gaming, and indulge in some nostalgia. Check in every Wednesday for retrospectives and other features on older versions of NBA Live, NBA 2K, and old school basketball video games in general. You’ll also find old NLSC editorials re-published with added commentary, and other flashback content. 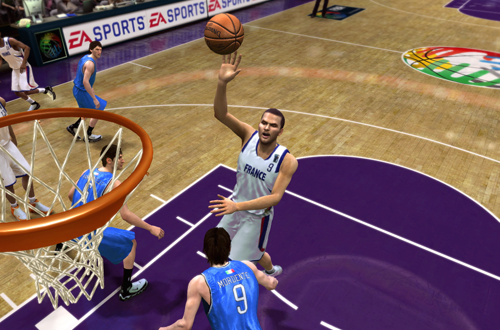 This week, I’m taking a look back at the FIBA teams in NBA Live 08. Bonus teams and content are something that we arguably take for granted in basketball video games these days. Both NBA Live and NBA 2K used to feature Decade All-Star teams, and of course, 2K has boasted an impressive selection of historical teams in recent years. Euroleague teams have also been featured in NBA Jam: On Fire Edition, as well as the past few NBA 2K titles. However, the interest in bonus teams really picked up after a selection of national squads was added in NBA Live 08, along with a mode representing the FIBA World Championship (now the FIBA World Cup). 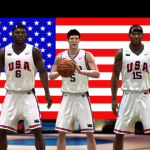 Before FIBA teams were officially added in NBA Live 08, national team and Olympic mods were certainly not uncommon. Many basketball gamers had also discussed the possibility of adding national squads while our Wishlists were being compiled, so EA Sports must have known that the interest would be there. With the acquisition of the FIBA license, EA were able to include teams for eight countries in NBA Live 08: the United States, Argentina, China, Germany, Italy, Greece, France, and Spain. Team rosters were updated as of around 2007, and the squads sported accurate uniforms. Although many of us were pleased to finally see FIBA teams in NBA Live, the small selection of squads did come as something of a disappointment to gamers whose countries weren’t represented. EA explained that the FIBA license had been acquired fairly late in the game’s development, limiting their ability to secure the rights for teams and players alike. The eight teams in NBA Live 08 were therefore intended to be a preview of things to come, spotlighting some of the top ranked nations, especially those who had an NBA player or two on their roster. Additional teams would indeed be added in NBA Live 09. We can’t talk about the FIBA teams without bringing up content that was ultimately scrapped from NBA Live 08: the hidden historical teams. Glancing at the roster files in the PC version, you’ll note that the team ID numbers for the FIBA teams begin with 72 (Argentina). The leftover player data for the historical squads includes assignments to non-existent teams with IDs of 60 through 69, confirming that the FIBA teams were added after the scrapped historical teams. While it’s possible that both might have been intended to be included at one point, it’s more likely that the FIBA teams are a replacement for the historical teams, given the late acquisition of the license. Given the enthusiasm for the retro NBA teams that Visual Concepts have featured in their games beginning with NBA 2K11, it’s probably fair to say that if EA Sports had been able to license the teams that were ultimately scrapped in NBA Live 08, they might have been more popular. Nevertheless, with the growing number of international players in the NBA and increased success of other nations in the Olympics and World Championship, the FIBA teams were still a solid choice. Their inclusion was welcomed, and gamers anticipated a wider selection of teams in future games. EA made another smart move in adding a FIBA World Championship mode for the teams to compete in. There wasn’t much to the mode – it was a single elimination tournament featuring all eight teams, with customisable brackets – but in all fairness, it didn’t need to be particularly deep or intricate. While it would have been nice to have a deeper mode with qualifying rounds and a round-robin tournament, it probably wasn’t feasible given the late addition of the teams, not to mention the fact that there were only eight of them. As it was, adding the tournament ensured that the teams had some kind of significant use outside of exhibition games. 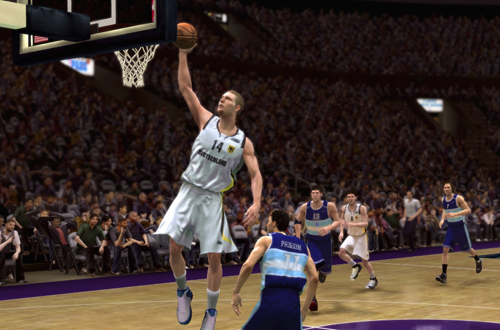 The teams and tournament mode were added in both the prior gen and new gen versions of NBA Live 08. Considering that the prior gen version of NBA Live was definitely becoming an afterthought at that point, this certainly came as welcome news. Most of the FIBA players in the PC and PS2 version were missing portraits, but it was still extra content. Furthermore, their inclusion resulted in the addition of a new team type, which came in handy when adding custom teams to rosters. Even the tournament mode could be put to use as a makeshift representation of the NCAA Final Four, a nifty bonus for college mods. Sadly, FIBA teams have disappeared from NBA Live. Although the selection of teams expanded to twenty-four in NBA Live 09 and they were still available along with the tournament mode in NBA Live 10, the rosters were not updated. NBA Elite 11 was supposedly set to feature lineups updated as of 2010, but of course, the game was ultimately cancelled. Following the series’ reboot in 2013 with NBA Live 14, there are no international teams to be found. While there are definitely more pressing issues to be addressed with NBA Live these days, bonus content wouldn’t go astray. To that end, FIBA teams and a World Cup mode might be a good idea. Meanwhile, 2K has featured the Dream Team in NBA 2K13 and NBA 2K17 (albeit as a pre-order bonus in the case of the latter), as well as Team USA 2012 and 2016, and the 2016 Australian Boomers. They’ve been welcome additions to 2K’s large selection of bonus teams, but they’ve lacked a dedicated mode, limiting their usage. It remains to be seen whether either series will include national teams and a tournament mode in any future releases, but if they do, I’m sure they’ll be received warmly. As it stands, the inclusion of FIBA teams in NBA Live 08 gave us a glimpse of what could be done, as well as a desire to see more bonus content and non-NBA teams in the games. Absolutely. Just a matter of securing the license; I’m sure the interest will be there. I’ve always wanted to have a full complement of FIBA teams in any basketball game. Especially now since 2K represents the game so well. My ideal situation is for the FIBA World Cup to be implemented into myLeague/myGM or whatever the franchise mode is being called. Every 2 years (since they probably can’t get the Olympic licence in the game as well) you get to play in the FIBA World Cup. If your team is good enough you can be hired as the “coach” of some nation and get to select the team to represent that country. Or you can select to just play the tournament as whatever team and be at the mercy of the CPU making the selections for each national team. Add in the ability for players to possibly have to be talked into joining the national team and you could have a good little offseason mode to go along with the front office duties. This could also be incorporated into myPlayer as you try to become a member of Team (insert country here). This would make your creation a bit more interesting. Do you make yourself from the United States with the knowledge that you will have a tougher time making the team or do you make yourself from a country that isn’t as good and maybe you can carry them to a gold medal. I’ve been wanting something like this for years ever since national teams were introduced to the NBA Live series. I had Team USA Basketball by EA for Sega Genesis and I played the hell out of that game. I would definitely jump at the chance for a current FIBA mode! That’s definitely an interesting idea for incorporating FIBA teams into all the modes. It’d be a fine use for them.